GW, a VA “VetSuccess on Campus” partner, hosted the event. Acting Secretary of Veterans Affairs Sloan Gibson addresses attendees in the Marvin Center on Monday. Seventy years ago, George Washington University student Don A. Balfour, A.A. '44, B.A. '45, became the first veteran to receive benefits from the Servicemen's Readjustment Act of 1944—a law that would give future veterans the opportunity to accomplish otherwise unaffordable educational goals. So it is only appropriate that the U.S. Department of Veterans Affairs (VA) chose GW as the location to commemorate the anniversary of the Act, more commonly known as the GI Bill. 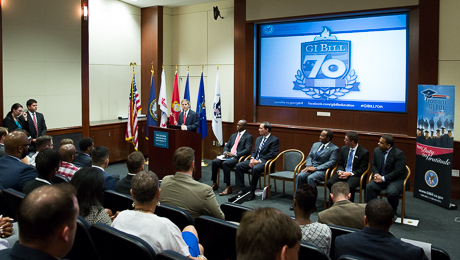 VA representatives joined GW student veterans, administrators, staff and members of veterans’ service organizations in the Marvin Center on Monday to reflect on the significance of the original GI Bill and to discuss the future outcomes of the Post-9/11 GI Bill. “As the son of a veteran who used the GI Bill for education and as a veteran who used the GI Bill, it’s a privilege for me to be a part of this,” said Vice Admiral (retired) Mel Williams, Jr., associate provost for military and veterans affairs, during his opening remarks that kicked off the celebratory event. 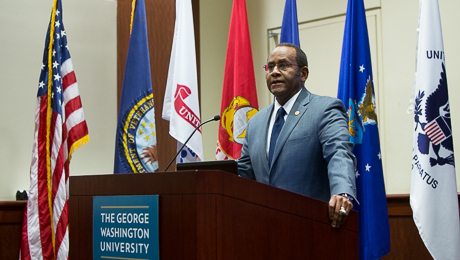 Vice Admiral (retired) Mel Williams, Jr., associate provost for military and veterans affairs, opened the GI Bill commemorative event on Monday. Mr. Balfour “represents the thousands who served in World War II and beyond, who are beneficiaries of this great GI Bill,” Adm. Williams added. These benefits made higher education—something that previously was only available to the privileged few—obtainable to working-class Americans and their families. In turn, the economy was ignited and the middle class was created, said Acting VA Secretary Sloan Gibson. Notable beneficiaries of the GI Bill include former President Gerald Ford, legendary musician Johnny Cash, actor and film director Clint Eastwood, to name a few, as well as 14 Nobel laureates. But Mr. Gibson said the majority of beneficiaries of the original GI Bill are “the everyday lynchpins, leaders in our communities and neighborhoods all across the country,” whose lives were changed in profound and often unexpected ways. “The bottom line? Education, how veterans used it, transformed the very fabric of our society,” he said. Subsequently, more than 50 years after the original GI Bill was enacted, the U.S. is continuing to invest in education for the next generation of veterans through the Post-9/11 GI Bill. It became effective for millions of service members and veterans in August 2009 and provides the most generous educational VA benefits since the GI Bill. The VA has distributed more than $41 billion in Post-9/11 GI Bill benefit payments to fund the education of more than 1.2 million beneficiaries. Speakers at Monday's ceremony included Sloan Gibson, Acting Secretary of Veterans Affairs; D. Wayne Robinson, president of Student Veterans of America; Vice Admiral (retired) Mel Williams, Jr., associate provost for military and veterans affairs; Jeremy Adkins, a student veteran at Rockhurst University; Steve Gonzales, assistant director of veterans employment and education at the American Legion. GW has participated in the Yellow Ribbon Program, a federally funded provision of the Post-9/11 GI Bill, for five years. The program provides full tuition and fees coverage for undergraduate student veterans, as well as for fully qualiffied Yellow Ribbon Program student veterans and their family members pursuing law and master’s degrees. Under the Yellow Ribbon Program, the federal government sets a national tuition assistance cap for private colleges and universities. GW then puts forth its own contribution, an amount matched by the VA. That amount increased for graduate students and law students in 2013. In 2013, GW also became one of 94 VetSuccess on Campus program partners. The VetSuccess on Campus (VSOC) program places experienced vocational rehabilitation counselors on college campuses to assist student veterans with enrolling in and applying for VA benefits, as well as directing them toward appropriate medical, career and counseling resources. Roger Deason, who served in the field of vocational rehabilitation for more than 20 years, is GW's VetSuccess on Campus counselor. “I am coming to understand how GW represents a best practice in post-secondary education for our veterans,” Mr. Gibson said. He commended the group of GW student veterans who were present at the event, whom he had spoken with during a roundtable discussion earlier in the day.